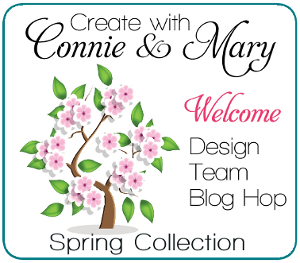 Woo hoo…it’s the Week 2 Blog Hop for the Create with Connie and Mary Spring Collection 2015! If you are going forward through the hop you arrived here from my friend and partner Connie Babbert Inkspired Treasures. She always has such GREAT projects! And oh that bugger…she is enjoying warm weather at Leadership in Florida! From Sunday through Friday our subscribers enjoy exclusive projects that only the get to see. Then on Saturdays our design team shares a card using the same set that they did for the collections. So…can you guess what set I used this week? I just LOVE the little bumblebee! Isn’t is just the SWEEETEST image you have ever seen? I honestly had no reason to buy it except it made me smile! Stamp bee using memento black and color using Calypso Coral and Skin Tone Blendabilities. Cut out. Stamp greeting on Calypso Coral using memento black, cut into a banner. Add behind bee and add to card front using dimensionals. Add white baker’s twine to Calypso Coral (SAB) button and add to card front using dimensionals. 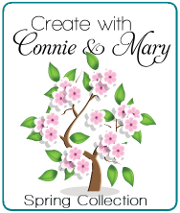 We just finished up week 2 of Create with Connie and Mary Spring Collection 2015 – and it’s still a GREAT time to subscribe! Our subscription is full of gift ideas, home decor, card sets and 3D project tutorials perfect for your stamp camps and classes! We’re using Occasions and Sale-A-Bration products from Stampin’ Up!’s Catalogs. Get over 24 projects for only $29.95 US…that’s just a little over $1 per tutorial! More details over on Create with Connie and Mary! Now it’s time to head over to Melissa Davis Rubberfunatics Blog. She has such GREAT ideas! This entry was posted in Create with Connie and Mary, Spring Mini and tagged And Many More, Baby Bumblebee. Bookmark the permalink.